Lesley Batchelor OBE is an expert on international trade and a passionate champion of UK exporters. She is Director General of the Institute of Export, the professional membership body for everyone involved in international trade. Here she gives tips for exporters on what their pricing strategy should be overseas. 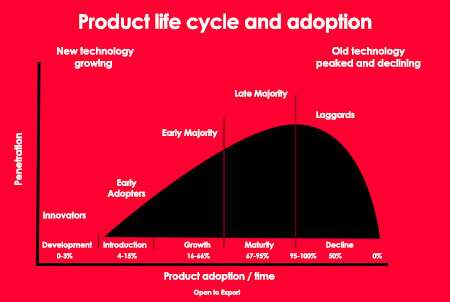 The product lifecycle model covers the stages of a product from launch to being discontinued. While the model will differ depending on your product and where you are on the timeline, the principle remains sound. There are very obvious variations within industries and sectors. The high fashion industry, for example, tends to have a very short life span of 13 weeks full price and 13 weeks sale price which is repeated over the year with two main seasons, although increasingly there are interim mid-season promotions happening to match the unpredictability of the British weather. However, an industry focused on producing a product that supplies a need – such as a kitchen utensil or a medical instrument – will have a life span over many years until it is superseded by a new innovation in the industry. This makes the planning process unique to your own business. This diagram shows the Product Life Cycle with the Adoption model superimposed which gives you the context in which you should use this model. You should recognise the position of your product on the curve and be aware of a few issues that place raises for your pricing strategy and your marketing strategies. At the introduction phase of your product you should look at how your pricing strategy reflects the newness and hopefully unique attributes. This is the time when, in some industries, you can charge a premium and recoup the development/market launch costs allocated to your product.Using this pricing strategy, if we drew a pricing line on this diagram it be the exact opposite of the curve in the early stage – in other words, pricing high initially and then flattening toward the decline of the product. This high price at the beginning is known as ‘skimming’ or ‘creaming’ the market. It can only last until the next product or a newer technology arrives in the market. If you decide not to ‘skim’ but to compete on price, this is known as market penetration pricing and can be quite dangerous especially if it leads to loss leader strategies – not recommended unless you have deep pockets. A chance to price high in a new market where your product is new. During the period of growth you may also find that changing the product is not needed but changing your marketing is. A marketing strategy that reflects the latest trend or the longevity of the product quality is another way of maintaining your product at the peak of its maturity curve and to get the maximum return on your investment. Usually, a pricing strategy is a mixture of industry knowledge and a gut feeling. However, the more research you do in international markets, the less guesswork is involved. Working with this product lifecycle model and linking it with ‘unit price’ calculations, which reflect the cost of marketing and researching new markets, will produce a successful long term strategy for your business. It builds sustainability into a start up business and turns it into an international business. Check out Open to Export’s video on getting paid internationally and webinar on taking your website and digital marketing global for more information.